Planning a wedding can be a stressful business, and as the clock presses forward leading you up to the altar, you’ll need some time to switch off and relax. And, most importantly – make sure you’re looking the part for your big day. 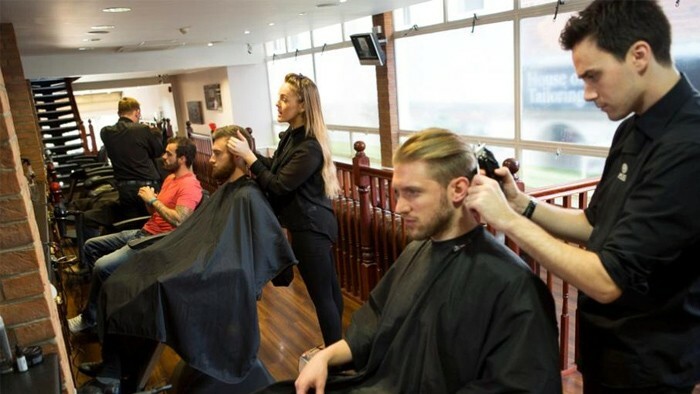 There are many experiences you can indulge in pre-wedding, including the all important stag do, but if it’s some manly pampering you’re looking for, complete with haircuts, wet shaves, beard trims, head massages – and in this case – a nice cold beer, then why not try out a Jacks of London ‘Grooming the Groom’ Wedding Package. Deluxe, Classic or Standard With 3 tailored wedding packages to choose from take your pick of different services and price combos for each person in your party, all dedicated to getting you ready for your big day. 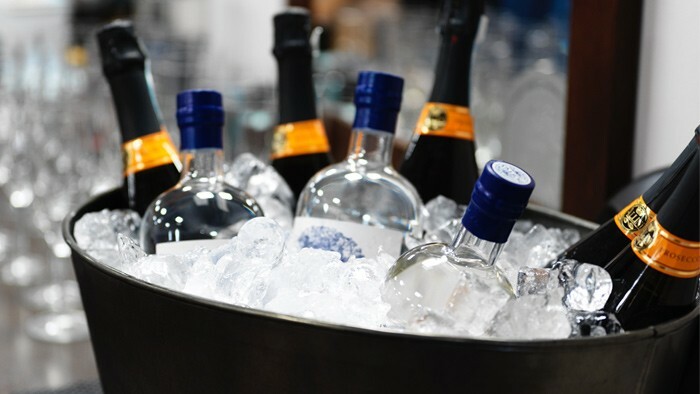 Each one includes the all important celebratory refreshments of beer or champagne to help calm the nerves and a Jacks goodie bag to take away with you. It’s good, clean, honest fun that you can enjoy on your own, giving you some much needed time away from bridezilla to collect your thoughts or alternatively bring in reinforcements and rope in all the other guys in your wedding party for some manly male bonding. Despite the wet towels and the general pomp that often accompanies a wet shave, it is the manliest of manly treats (think Marlon Brando in The Last Tango in Paris), and also a great hangover cure, so what better way to help you prepare for your big day (and get over your stag do!) 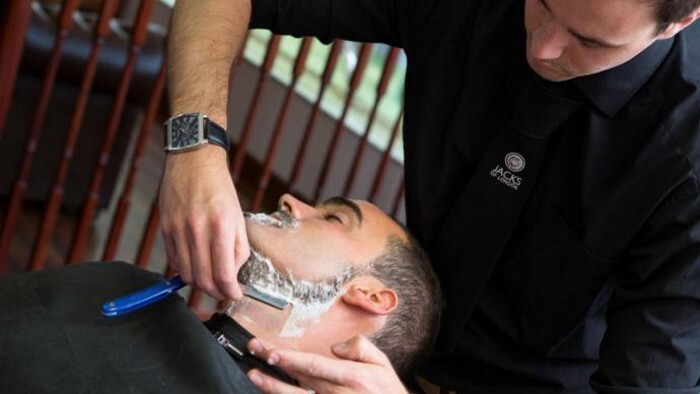 than to indulge in the process of a traditional cut- throat shave. Some people are curious and unsure about having an open blade anywhere near them, but rest assured, you’ll be looked after by top industry professionals who could do a sound job with their eyes closed. It’s a highly relaxing experience and one you’ll likely want to repeat at any opportunity. Once the hot towels have been removed, a shaving oil will be massaged into your face and then shaving cream applied in small but rigorous circular motions using a traditional shaving brush. This encourages the bristles on your face to stand up, which prevents in growing hairs, also helped by your pores having been opened by the hot towels. 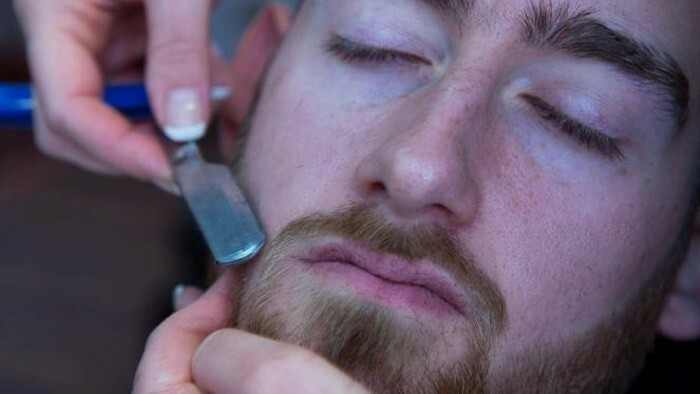 One of our professional barbers will then use the cut-throat razor to shave your face, once with the grain and then against the grain. You’ll likely wake from your slumber around this point, and as many have done before, take a large gulp of your beer, champagne or coffee to help bring you back into the land of the living. After your scruffy beard or stubble has disappeared from your newly silken face, you’ll get to experience the real fun part: the freezing cold towel. You’ll want to breathe in at this point. The cold can come as a bit of a shock to the system, but after the initial few seconds, it becomes the most invigorating feeling. Just like an ice bath. It will awaken your senses and close your pores. A moisturiser will then be massaged into your skin and you will feel fresh faced and super smooth for days. And if the clean shaven look isn’t your thing at the moment what with the beard still remaining firmly on trend, then why not try out our D-TOX Face Invigorator skin service or go for an exclusive beard trim to make sure every hair is firmly in place. Don’t Risk It With so much prep going into one day, you’ll appreciate looking sharp and feeling confident. 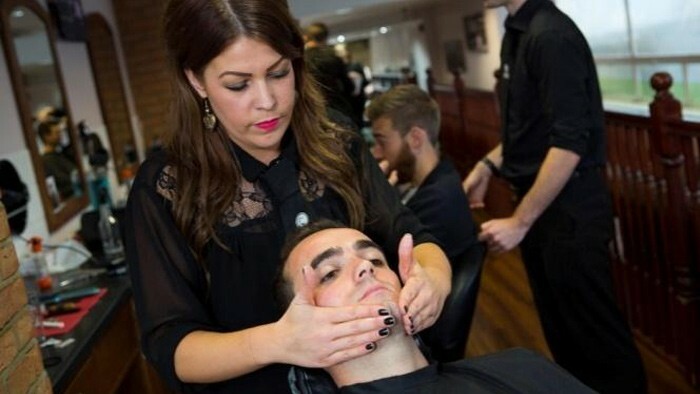 Why risk getting a dodgy haircut or an unsightly shaving rash on your big day. Considering the amount of money going into the wedding, it’s a small cost that reaps a big reward if it goes well and a disaster if it doesn’t. One that is way too well documented in about a thousand wedding photos to ever be forgotten! Check out what else we offer for more details on our Jacks of London Wedding Packages and our various locations. Book in advance to avoid disappointment and receive a discount for group bookings. On Monday 11th September the Jacks of London team attended the prestigious HJ British Hairdressing Business Awards, where we were nominated as a Finalist in both the ‘Marketing Award’ & ‘Male Grooming Salon of the Year’ categories. Looking for the perfect gift for him this Christmas? 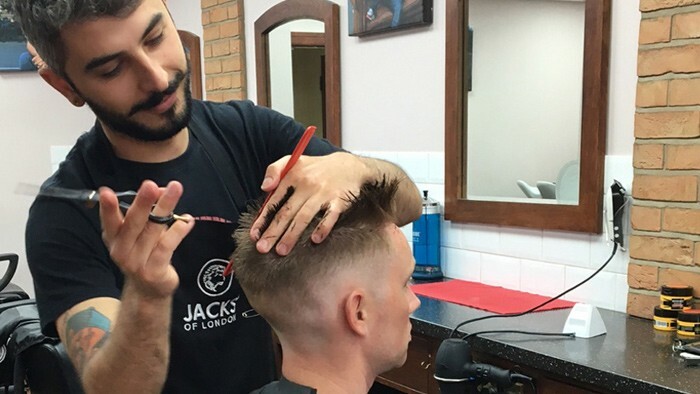 Why not treat him to some Jacks of London Style Vouchers?